These Democratic candidates hope that an apogee of GOP extremism will help fuel their collective bid to break a 24-year losing streak. Don’t bet on it. Coming out of the May runoffs, the Texas Democratic Party finally has its statewide ticket firmed up. And at a “Blue Wave Slate Jam” fundraiser in Austin on Tuesday, party leaders and candidates insisted that the slate is strong enough to break a 24-year drought — the worst of any state party in the Union. Of course, if elections were won on diversity, hard work and baseline competence, Texas politics would be a different game entirely. But in reality, the Democrats’ statewide slate is not exactly a political dream team. The seven candidates for statewide public office (not including judicial candidates) have little political experience, little to no name recognition and hardly any money. They face long odds against their Republican incumbent opponents. But they’re not letting that get in the way of their optimism. “In 2018, the people are gonna beat the Republican machine,” gubernatorial nominee Lupe Valdez declared at the Tuesday event. While the national Democratic Party is engaged in sustained internal reckoning with its ideological future — one that’s magnified the slightest policy differences — the Texas Democratic slate’s core message underscored on Tuesday was light on policy and ideology, instead emphasizing their competence and normalcy in contrast to an extremist state GOP. Notably missing from the slate kickoff was U.S. Senate candidate Beto O’Rourke, who is a statewide Democrat in a league of his own, having raised boatloads of money and become something of a national media darling (though most Texans still don’t know who he is). But he’s largely kept his distance from the rest of the Democratic ticket, preferring to focus on his singular style of county-by-county campaigning. 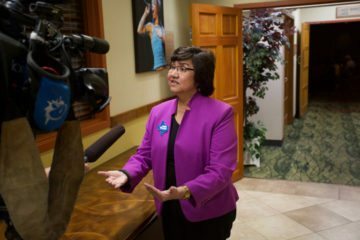 At the top of the ticket is former Dallas County Sheriff Lupe Valdez, who just won her runoff against Houston businessman Andrew White by a much narrower margin than expected. She’s a candidate with a strong story — Valdez is the daughter of migrant workers and the first openly gay and Latina candidate to win a major party nomination for governor in Texas. But Valdez has repeatedly struggled to grasp state policy issues and failed to make a strong case for why she’s any more of a viable candidate than past Democrats who have run for governor. On top of that, she’s a dream foil for her opponent Governor Greg Abbott. That said, Valdez is the relative bright spot on the ticket. Having been elected Dallas County sheriff four times, she has the most electoral experience and is the most compelling candidate. “We have real problems in this state, and everybody knows what they are,” he added, citing public education, health care and gun violence before contrasting those issues with Patrick’s political obsession with bathrooms. “More Republicans have been caught doing bad things in bathrooms than all the transgender community combined,” Collier quipped. The candidates just get more inexperienced from there. There’s attorney general nominee Justin Nelson, a Houston attorney who has no statewide profile or political experience, but has loaned his campaign $500,000 and is hoping the fact that his opponent, Attorney General Ken Paxton, has been indicted for securities fraud will help propel him to victory. Kim Olson, a fiery retired Air Force colonel who’s running for agriculture commissioner, is the only other candidate on the ticket to have been elected to public office; she won a seat back in 2007 on the board of trustees for the Weatherford Independent School District outside Fort Worth. She’s trying to make the case that Agriculture Commissioner Sid Miller is a uniquely embarrassing and offensive strain of Texas Republican (a fair point) and that a mass political awakening among women in the state will give her an edge. Miguel Suazo, an energy lawyer and former congressional staffer, is running against Land Commissioner George P. Bush. Joi Chevalier, an entrepreneur who runs a culinary incubator in Austin called The Cook’s Nook, is slated to take on Comptroller Glenn Hegar. And Roman McAllen, whose greatest claim to fame is that his great-great grandfather founded the city of McAllen, is running for railroad commissioner against incumbent Christi Craddick. Democrats have struggled now for two decades to compete statewide. The last time they managed to win a statewide race was in 1994 and the last reasonably competitive election cycle was in 1998, when Democrat John Sharp came within two percentage points of beating then-Lieutenant Governor Rick Perry and Comptroller nominee Paul Hobby lost by just 20,000 votes. In the end, somebody has to run as the alternative to this crazy cast of incumbent Republicans. Since then, it’s only gotten worse. In 2014, the year of Wendy Davis’ much-heralded gubernatorial bid, every statewide candidate lost by at least 20 percentage points. That was a slight improvement over how the Democratic ticket fared in 2010, when every candidate — except for gubernatorial nominee Bill White, who came within 13 points of Governor Rick Perry — lost by 25 points. That year, the party didn’t even field a candidate for comptroller. The odds of victory are long for the Democratic slate, but they can at least serve as competent cheerleaders for the party’s base. It’s easy to beat up on Governor Greg Abbott for enabling Jade Helm conspiracies, Dan Patrick for hawking a political doctrine centered on demonizing trans people, Ken Paxton for being under indictment for criminal fraud and suing against any federal Obama initiative that’s still moving, Sid Miller for pushing vile Islamophobia and appointing an unqualified campaign donor to a government task force, George P. Bush for his silver-spooned incompetence, and so on. While some Democrats are pollyannaish about the prospects of a wave election year turning Texas blue — which is itself a useless frame through which to view state politics — the more sober hope for a Texas blue wave is to make modest gains in the Legislature and flip two or three congressional seats. Still, it’s a rather impressive feat to field the full slate of statewide candidates on display Tuesday — especially when a long line of more high-profile Texas Democrats balked at taking the plunge. In the end, somebody has to run as the alternative to this crazy cast of incumbent Republicans. While they may not succeed this cycle, perhaps they’ll be able to sow the field for the future.